A Fox Five news crew with Justin Gray was banned from attending a public ceremony where Gov. 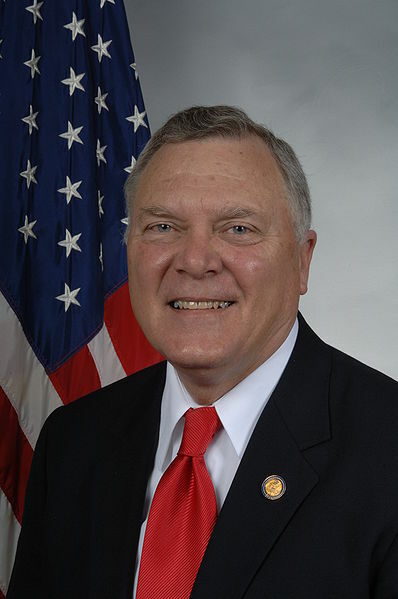 Nathan Deal was to sign a new immigration bill into law yesterday. In a video on myfoxatlanta.com, Georgia State Troopers can be seen barring the news crew from the press conference. The incident apparently stems from an earlier story run by Fox Five that investigated Deal’s campaign fund. The story reported that $90,000 payment was made to a fundraising company with ties to the governor’s daughter-in-law, Denise Deal. The story reported that Denise Deal’s name was not disclosed on any records relating to the company that they could find. Rodney Ho of accessatlanta.com spoke with Brian Robinson, a spokesman for Nathan Deal. Ho quotes Robinson as saying that the governor’s campaign never hid the fact that Denise Deal worked for the company, Southern Magnolia Capital. Ho further says that when challenged by Robinson, he googled “Southern Magnolia Capital” and immediately found Mrs. Deal’s name in the second search result, the Georgia Chamber of Commerce website. Robinson is quoted as saying that Fox Five was barred from the press conference because they did “a shoddy piece of journalism in which they should be embarrassed.” The governor’s office is demanding an apology and felt that restricting Fox Five’s access would be a way to punish them. So far no one is accusing Gov. Deal of breaking any laws, but the story implies that there is at least the appearance of a conflict of interest. Deal, who was congressman before running for governor, has been accused of ethics violations in the past. He was under investigation when he resigned from Congress to campaign for governor for allegedly steering state business to his company. He is also accused of failing to report $2.85 million in business loans on state election disclosure forms. The loans almost led him to declare a personal bankruptcy last year. The immigration bill that Fox Five was to witness Deal signing was passed by the General Assembly in April and cracks down on businesses that hire illegal immigrants and gives local law enforcement the power to investigate immigration status. Critics charge that it will hurt Georgia businesses and lead to a costly legal battle as a similar law did in Arizona. At the moment though, the biggest controversy is not over what was in the bill, but over who was not at the signing. A minimal amount of investigating on your part would have uncovered the fact that the Chamber of Commerce listing in the Google results was added on May 10. The Fox report clearly stated that they were investigating in March and were unable to find any evidence of Mrs. Deal’s affiliation to Southern Magnolia. The governor’s office caught wind of the Fox story before it was broadcast and pre-emptively had Mrs. Deal join the Chamber of Commerce.